All About J.H. Wagner & Sons, Maser Stone Masons since 1896. Master Stone Masons, J.H. Wagner & Sons Pty. Ltd. is a privately owned and operated Stonemasonry company incorporating all aspects of stone, building and monumental masonry. J.H. 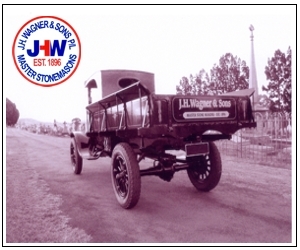 Wagner & Sons was established in 1896 by John Henry Wagner. Primarily a specialist provider of Australian Helidon Sandstone, Granite, Basalt, Porphyry, Marble products and services, the company continues today as a fifth generation Wagner family enterprise. The company owns and operates an advanced manufacturing facility in Toowoomba, a large Sandstone Quarry at Helidon and a Brisbane office and distribution centre. The business proudly boasts fourth generation family members managing the company and working alongside the fifth generation family members currently honing their skills and trade of Stone Masonry. Together these family members provide over 160 years of experience in the stone industry and still hold strong the values of personalised service, quality supply and dedicated promotion of natural stone. Monumental works have remained a core focus of our company and with diversification into commercial project supply we have been able to further enhance the range of products and services being offered. We welcome your enquiry for stone sourcing, stone quarrying, stone processing, fine detailing, stone carving, all facets of stone working, stone restoration, installation and consultation. If taking a walk through over one hundred Cemeteries in South East Queensland and Northern New South Wales area you may notice the trademarks of John Henry (Harry) Wagner and his descendants as the tradition of monumental work is passed from one generation to the next. Our monumental services was the start of the family business established in 1896 by John Henry Wagner, who had completed his monumental trade at Bruce Brothers, another Toowoomba business which unfortunately has since ceased to operate. John Henry Wagner was known as Harry and many monuments and headstones bearing the trademark 'H. Wagner' still stand as testament to his skill. The design and style of monuments has changed dramatically since 1896 with smaller memorials and personalised designs now more common. Monumental service may not be the largest proportion of natural stone supply from J.H. Wagner & Sons, however the pride of these works is fully recognised. The enjoyment of working in stone is complimented by many products and quality service available from J.H. Wagner & Sons. Restoration, Aluminium Plaques, Bronze Plaques, Ceramic Photos, Laser Etching, Vases, Statues, Ornaments, Marble Chips, Designs and Artwork are just brief descriptions of JHW products and services. After more than 120 years, the tradition and skill continues and strengthens; our staff can assist you in design, local Government compliance, Cemetery section requirements, pricing, manufacture and installation, as well as refurbishment, restoration, repair and clean-up work. For caring and dedicated service we invite you to view the extensive displays, online photographs and personal appointment bookings available at our Toowoomba office and our works display at Sumner Park Brisbane office. We value the opportunity to assist you, promoting quality selection coupled with professional and courteous attention from quoting to completion. JHW provides our valued client with ease of parking, location convenience and a warm invitation to visit, browse and obtain monumental services. *Appointments for monumental enquiries may be made at JHW Toowoomba office - telephone: 4634 7422. ÏSecuring your information – JHW values your privacy. Thank you for sharing your information with us. When you request a quote from J.H. Wagner & Sons we will collect information such as your telephone contact number and address details which permits easy transition of the quote offer into a working order should you wish to accept our quotation. Your information will be used only to supply the quote or information which you have requested. We will not provide your information to any third-party marketers. Your JHW contact representive may make contact via telephone to enhance the communication process and clarify the product requirements for your project. Your JHW contact representative may provide follow-up contact at appropriate times to facilitate the best possible customer service experience. We welcome your queries or feedback regarding JHW’s communication process.